New crossover from Nissan | What Car? 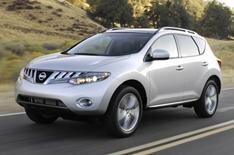 Nissan has announced plans to make another crossover vehicle. This new car will sit below the successful Qashqai and will be built at the company's Sunderland factory. Like the Qashqai, this new model will have a lofty driving position, but will have a sportier emphasis. Expect the new model within the next 12 months. A little further off will be a diesel-powered Murano. Nissan hasn't yet said which diesel engine will power the Murano, but says the car will be available within two years. What will be here before the end of the year is a special edition Qashqai called the Sound and Style. Style means 18-inch alloy wheels, metal roof rails and silver door handles and grille. It has part-leather upholstery and carbon fibre trim. Sound comes courtesy of an upgraded Bose stereo system. Sound and Style Qashqais will be available with either the two-litre petrol or diesel engines and will cost 500 more than the range-topping Tekna models.